Complementing photos with color in a scrapbook layout is the key to designing pages that are both attractive and personally meaningful. 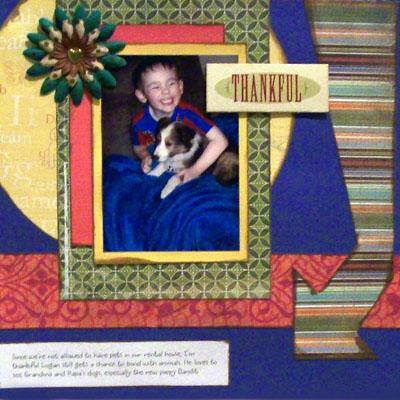 When choosing a color scheme for your scrapbook layout, you have several different options. A monochromatic color scheme uses varying shades of the same color, such as light and dark purple. An analogous scheme uses colors that are next to each other on the color wheel, such as purple and blue. A complementary scheme uses colors that are directly opposite one another on the color wheel, such as blue and orange. A triadic scheme combines three colors that create a triangle on the color wheel, such as red, yellow, and blue. With so many patterned papers and embellishments available, there are products suitable for any color scheme you can imagine. If you are interested in digital scrapbooking, you can even use the eyedropper tool in your favorite image editing software to create papers that are a precise match to the colors in your photos! If you have photos that are very busy, with lots of competing colors, it can be difficult to choose a scheme that looks appropriate. This is a very common problem with photos from a child's birthday party, a carnival, or any event with large groups of people wearing several different types of outfits. Adjusting the brightness, contrast, and saturation of the photos in your favorite image editing software can help balance things out or you can simply print the photos in black and white to make them easier to work with. 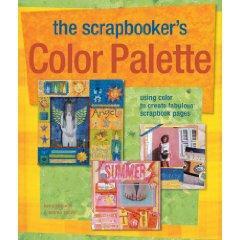 Do you find yourself debating endlessly about which colors to choose for your scrapbook projects? Perhaps it's time to make a color idea book! Fill a small 3-ring binder or composition book with photos, clippings, and notes describing the interesting color combinations you see all around you. You can look at your favorite scrapbook magazines for ideas, but they're not the only sources of inspiration available. Clothing displays and interior design shows are also excellent places to find ideas for unique color schemes. Even the paint chips at your local hardware store can provide some much needed inspiration! Another great way to develop your color confidence is to try making several versions of the same scrapbook layout using different color schemes. This will help you see how color affects other design elements and give you a better idea of what colors best fit your personal sense of scrapbooking style. If you find yourself consistently reaching for the same colors, this doesn't necessarily mean you are a "boring" scrapbooker. Some of the most noted scrapbook designers freely admit they have a "signature" color. For example, Cathy Zielske, author of Clean and Simple Scrapbooking, admits to having a love affair with kraft colored cardstock. The LoveToKnow Scrapbooking article Color Theory and the Color Wheel also contains several tips for how to use color effectively in your scrapbooking projects.